JetBlue’s relief program encompassing 100 days and 35 ways – and beyond - of caring for Puerto Rico now transitions to its long-term recovery phase. 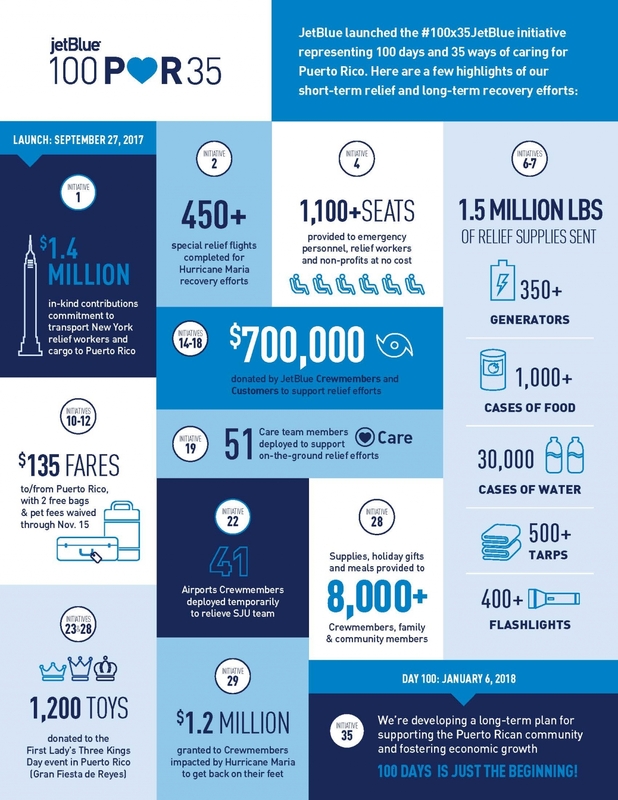 NEW YORK, January 9, 2018 /3BL Media/ – JetBlue (NASDAQ: JBLU) announced the 100-day milestone of its 100x35JetBlue hurricane relief initiative, which launched shortly after Hurricane Maria struck Puerto Rico in September 2017. A nod to the island’s 100x35 mile dimensions, 100x35JetBlue outlined 100 days and 35 ways – and beyond – of caring for Puerto Rico and the Caribbean. JetBlue has completed or launched 34 of the 35 initiatives, and now transitions to initiative #35: developing a long-term plan for supporting Puerto Rico and fostering economic growth. For more information and updates on JetBlue’s 100x35JetBlue initiative, and ways to assist in Puerto Rico’s continued recovery, visit www.jetblue.com/100x35.